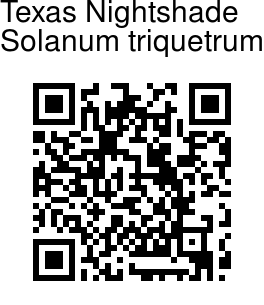 Texas Nightshade is a perennial herb, rising up to 115 cm tall. Stems are initially 3-angled. Leaves are helically alternate, simple, stalked, without stipules; stalk up to 8 mm long, indistinct from blade; blade deltate to triangular or narrowly triangular, up to 30 x 15 mm, flat, heart-shaped, or tapered at base. Sometimes rounded basal lobes are present. Flowers are borne in cymes, 4-6-flowered, often with 2 flowers at each fork, hairless. Flower-cluster-stalk at anthesis up to 1.5 cm long. Flowers are bisexual, radial, 1.1-1.5 cm across; calyx 5-lobed, Flowers are 5-petalled,	white, in bud white and green including pale green veins; tube wide funnel-shaped, 7-8 x 3-3.3 mm, 3-3.5 mm wide at orifice, lower portion green, above pale green star pattern into lobes, pleated at sinuses; petals spreading, pointed-ovate, in range white. Stamens are 5, fused to flower at base in ring about 0.7 mm long. Fruit is a berry, many-seeded, spheroid, 7-10.5 mm, black to dark red, hairless; pulp thin. 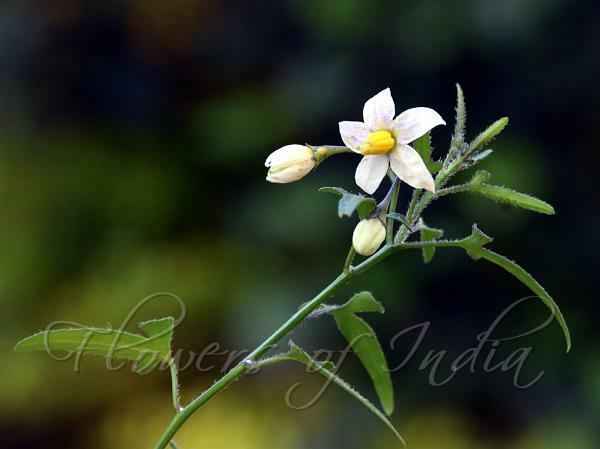 Texas Nightshade is native to the USA.